285 pages | 1 B/W Illus. 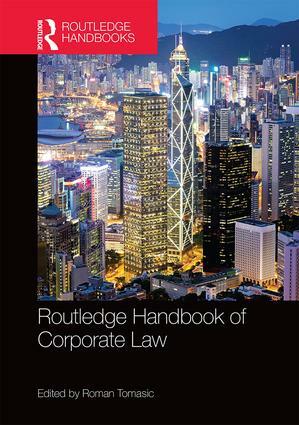 The Routledge Handbook of Corporate Law provides an accessible overview of current research in the field, from an international and comparative perspective. Providing up-to-date and authoritative articles covering all the key aspects of corporate law, this reference work is essential reading for advanced students, scholars and practitioners in the field. Roman Tomasic is Professor of Law at the University of South Australia and, until 2012, held a continuing appointment as the Chair in Company Law in Durham Law School at Durham University. He has been the Chair of the Australasian Law Teachers' Association and has also been active in legal research and the development of legal education in Australia, the United Kingdom and East Asia.